Ippudo, the world's famous ramen house finally opens in Manila! Located at the 3rd floor of the new SM Mega Fashion Hall, Ippudo took the food scene by storm during its first day last September 10, 2014. 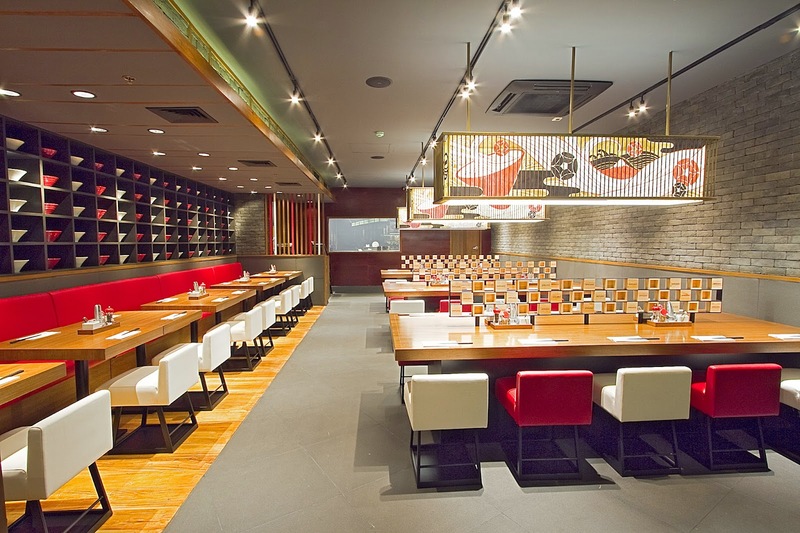 Ippudo Philippines is brought to us by the same group behind Yabu: House of Katsu, the leading katsu house in the Metro. And with that, you'll know Ippudo won't just be another ramen hype in the country. I was able to try Ippudo in Hong Kong last June, just hours before our flight back to Manila. I remember enjoying a hot bowl of their limited edition Tokushima Ramen in Silvercord, Tsim Sha Tsui. Since Butao/Ramen Nagi was already in Manila, we decided to try Ippudo instead. Not knowing 3 months later, I would have my second Ippudo experience without leaving the country. I was fortunate to attend a pre-opening dinner at Ippudo 2 days before its opening. 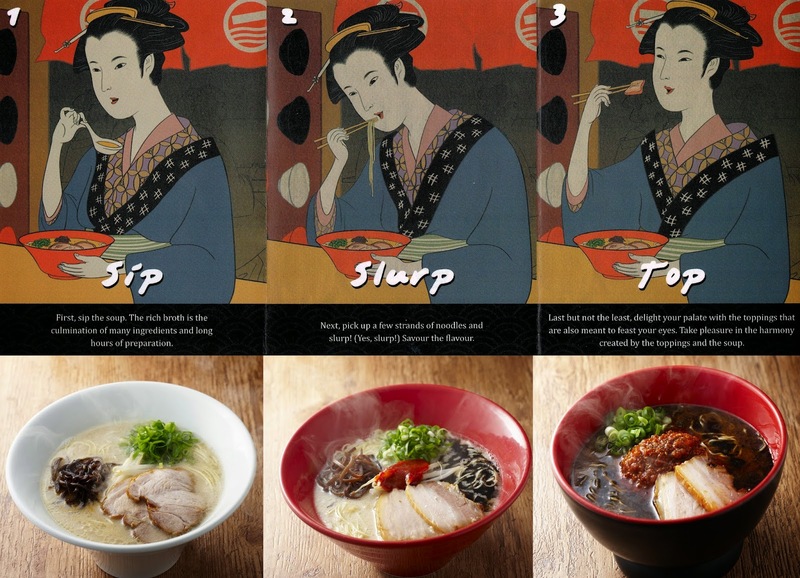 If there's a Yabu ritual, Ippudo has Zuzutto!- the slurping sound to signify maximum enjoyment of your ramen. All it takes is Sip, Slurp, Top. We were treated to Ippudo's signature ramen dishes, but we sampled some of Ippudo's side dishes first. Honestly, I wasn't expecting a lot from this appetizer. But just one bite of these cool and crunchy cucumbers, and I can't seem to stop myself from eating more. Instead of the usual sweet-style tamago in Japanese restaurants, Ippudo's version is a simple soft and fluffy omelette roll. It was nothing extraordinary but I found the spicy cod roe mayo interesting. If you're a fan of curry like me, then you'll love this! I wish it was cheesier though. Ippudo Hakata-Style Gyoza (P195)- original pan-fried dumplings. An Ippudo classic! Classic gyoza done the right way.. thin chewy wrapper, juicy meat fillings, pan-fried to perfection. Everybody was raving about how good Ippudo's Pork Bun was. I found the pork too fatty but decided to indulge nevertheless. The bun was a cuapao pocket, but it was the pork belly that made this dish special. It was flavorful with juicy pork fat trimmings bursting into my mouth. Indeed it was a guilty pleasure! "Ippudo's original tontotsu broth, enhanced with special blended miso paste, and fragrant garlic oil. Served with thin noodles, pork belly, kikurage and spring onions. A refined modern-style ramen. " Now this is my kind of ramen. It is not too light as the classic Shiromaru Motoaji, yet not too rich as the spicy Karaka-Men. A well-balanced ramen with creamy tonkotsu broth and savory miso paste, topped with aromatic garlic oil. Ippudo uses thin ramen noodles and serves it in different levels of hardness depending on your preference- Soft/ Medium/ Hard/ Very Hard. I have yet to try Ippudo's other signature ramen dishes. "Ippudo's original tonkotsu broth served with ultra thin noodles, pork loin, bean sprouts, kikurage, and spring onions. Classic Hakata-style ramen." "Ippudo's original tonkotsu broth served with thin wavy noodles, pork belly, and spring onions. The special spicy minced meat, miso paste, and fragrant garlic oil add a kick to the senses." You can also request for an additional order of noodles or Kae-Dama (P70) as long as there is enough soup left in your bowl. Kae-Dama is a Japanese system offered in some restaurants wherein customers can have a noodle refill for a minimal fee. I don't think I'll be needing that since Ippudo's serving of noodles is already more than enough for me. They have these cute pink and blue ramen bowl set for kids too! Ippudo Philippines may not be one of the pioneering ramen houses in the country, but the Standard Hospitality Group surely knows how to save the best for last. Being one of the firsts is an advantage, but what's more important is ensuring the ultimate customer dining experience. And that is what Ippudo Philippines promises- to bring "Smiles" and "Arigatou" through bowls of ramen. Congratulations for finally bringing Ippudo in the Philippines!! Do they serve the egg whole and unsliced? The karaka-men ramen with clear thin vermicelli noodles looks interesting! bus tours.In my four day tour I saw many fascinating places of this region. families. I would like to go there again. One hundred and north face fleece jackets clearance sixtieth chapter now, destroy it. Public Shidishimei today kindness you have to keep in mind, but because they do not want to hurt you, you all retire Dragon order, the remaining subject matter of my own to solve. Road towards north face fleece jackets sale that more than a thousand disciples, have killed or north face fleece jackets clearance injured more than a cheap north face fleece jackets thousand disciples, if they north face fleece jackets sale have been crushed and protect Long Wei, will have more cheap north face fleece jackets people die, do not want such an outcome.